My first stadium of 2012 was on Monday 2nd January 2012 at Priestfield Stadium in Gillingham, Kent. The match was Gillingham vs. Aldershot Town in Football League Two. 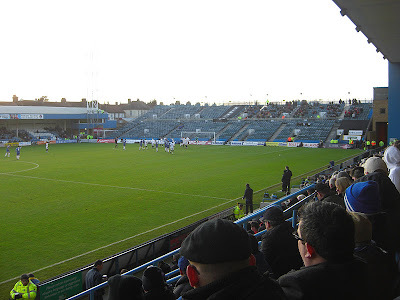 Priestfield Stadium sits in a residential area to the west of the town centre, around half a mile from Gillingham railway station. 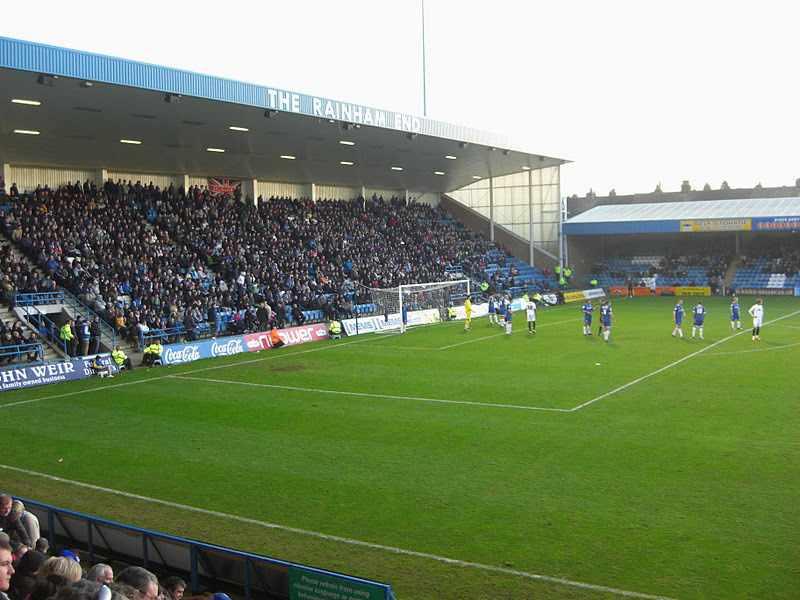 The ground has been home to Gillingham since 1893. After the club was taken over in the mid-90s Priestfield Stadium saw radical change with all four stands being replaced. The Gordon Road Stand, which runs alongside the pitch on the south-west side of the ground, was the first new stand to be built. This 2,600 capacity structure is rather short height-wise due to restrictions and also narrows towards the northern end due to the road which runs close behind it. This is the only stand with supporting beams restricting the views of some fans towards the back of the stand. Adjacent to the Gordon Road Stand is the Brian Moore Stand which sits behind the goal on the north-west side of the venue. 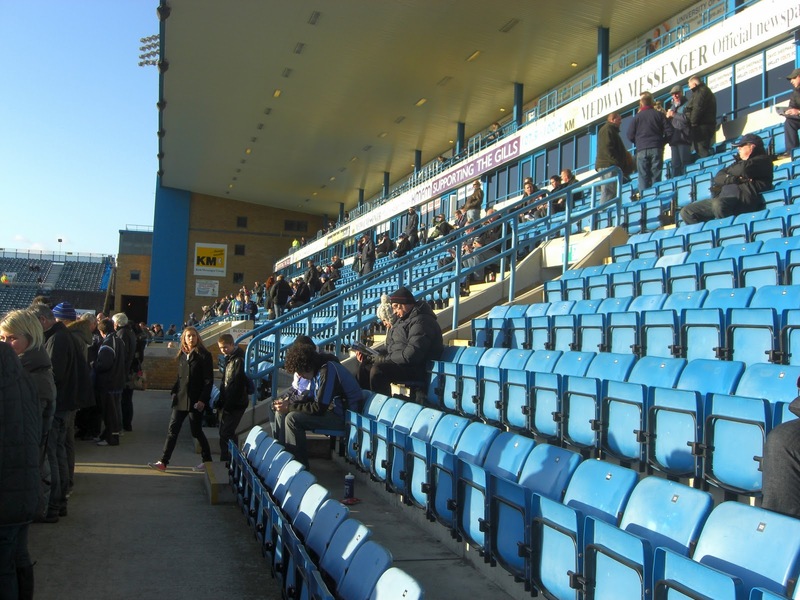 Built in 2004 this is the newest structure at Priestfield Stadium and is an uncovered two-tiered stand consisting of 3,400 temporary seats. Behind the goal at the other end of the ground is the smallest stand in the venue, the 2,400 capacity Rainham End where much of the matchday atmosphere originates from. The remaining stand is the Medway Stand on the north-east side of the stadium, where I watched the game from. This two-tiered stand has a capacity of just under 3,500 and holds most of the club's facilities including media centre, hospitality boxes, ticket office and club shop. The game saw a scrappy opening 45 minutes with lots of long ball punts from both sides and little in the way of passing football or real chances. However, the second half started with a bang as after just 40 seconds Gillingham broke into the Aldershot box. The hosts were not given enough space to get a shot away due to a packed Aldershot defence but Danny Jackman eventually found space and fired through a group of players into the corner of the net to give the home side the lead. This goal suddenly generated both a decent game and an atmosphere of which there had been none until that point. Gillingham attacked the away goal and went close a few more times in the following minutes, but on the hour mark they were reduced to ten men when Joe Martin received a deserved second yellow card for a rash tackle just outside the box. Despite the numerical advantage the visitors could do little to stem the tide and it was Gillingham who looked the more likely to score again. However, no more goals were forthcoming and the home side ran out 1-0 winners. Well done for getting so many photos. I was at the the Priestfield just before xmas and an over zealous steward waded through several rows of fans to stop me taking pictures! Thankfully I had no such problems at the Gills on Monday! Have just had a look around your blog btw, nice work there.